433, HUBCAP USED 15", 85-89, CHRYSLER, DODGE, PLYMOUTH, 5TH AVE, CARAVELLE, DIPLOMAT, GRAND FURY, NEW YORKER, (RWD), WIRE TYPE. 433, HUBCAP USED 15", 85-89, CHRYSLER, DODGE, PLYMOUTH, 5TH AVE, CARAVELLE, DIPLOMAT, GRAND FURY, NEW YORKER, (RWD), WIRE TYPE. A THRU INTERCHANGE LESS THE CAP & MEDALLION, CENTER SOLD SEPARATE. 562, Hubcap used, 14", 65, CHRYSLER, NEWPORT (RWD), CHROME OUTER RING, MACHINED, RIB TYPE, RED CENTER, THREE GOLD CROWNS, METAL CLIPS. 579, Hubcap, 15", 66, CHRYSLER (RWD), DODGE (RWD), PLYMOUTH (RWD), 14 SLOT TYPE. 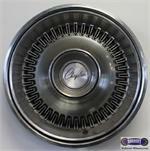 8003b, Used Rims, 15X7, 5 LUG, 5", 91-94, BUICK, CHEVY, OLDSMOBILE, CADILLAC, ROADMASTER, RWD, PASSENGER, CAPRICE, STEEL.